Welcome to another sunny week, and to today’s guest post, which is discussing how to style your display cabinet. Some great tips here, so do let me know what you think. Enjoy! Whether you’ve got a bookcase or a glass display cabinet, making it look good can add to the ‘edited’ feel of a room. Just shoving unwanted stuff on your shelves won’t work well if you want a room to look like a put together room, so make sure that you take the time to style your shelves. 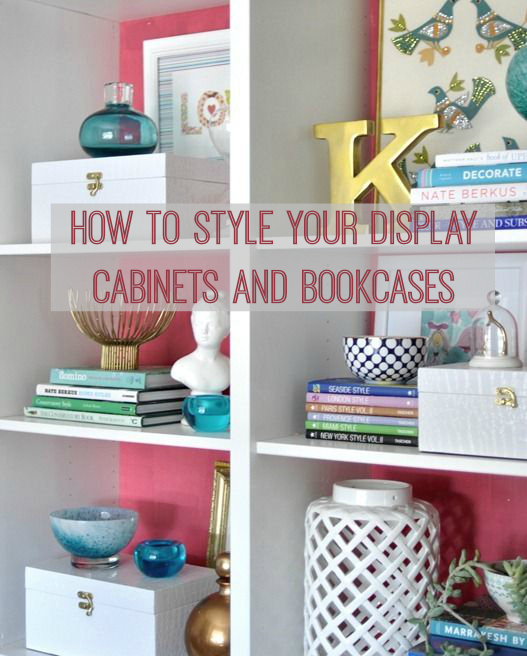 Follow our tips for a styled display cabinet. While it might seem like an obvious tip, filling it with treasures, whether it’s books, vinyl, artwork and ornaments, will make sure your display cabinet doesn’t look too sparse. Adding different heights to your shelves will make it much more interesting to look at, too. Having all of your pieces in one place will make it easier to find. Remember, your bookshelves are an important storage space, so you need to use them wisely. If you want to add a pop of colour to your display cabinet, consider wallpapering the back of the unit, behind the shelves. This will draw the eye in and add dimension. Group things in odd numbers. You might have heard it one million times before, but things really do look better in odd numbers – and three is the magic number at all times! Arrange according to size. Place small items at the front and the larger behind. A little bit of sneaky storage always comes in handy on your shelves – they seem to be clutter collectors. From keys to sunglasses to homework, something that was never supposed to be there will probably end up there. A pretty tray or a bowl is perfect for this purpose. Nestled between some books or between ornaments, you can at least put this clutter somewhere where it looks like it’s supposed to belong. Failing this, try investing in a display cabinet with concealed areas, like these from Furniture Plus. This allows you to hide stuff that you don’t want on show. So, whether you have a bare bookcase to fill up or you’re looking for a way to make sense of your packed shelves, make sure you follow our tips for beautiful display cabinets that will be a perfect representation of you and yours. I have just discovered this website and I am loving the tips. i have just moved into a new rental flat which has wall to wall shelves. The shelves out weigh any amount of books / nik naks we have. I have really loved reading these tips. I love styling things and reaaranging and grouping them. I really must buy a bookshelf for my living room so I could do this more.